Chop cucumber crosswise into two equal-sized pieces. Use a peeler or knife to cut cucumber into thin lengthwise pieces. Cucumber pieces should be thin enough to roll, but not tear. Lay cucumber slices on a cutting board to assemble. In a small bowl, mix mayonnaise/cream cheese and Sriracha. Spread a thin layer of Sriracha mayo on each cucumber slice. 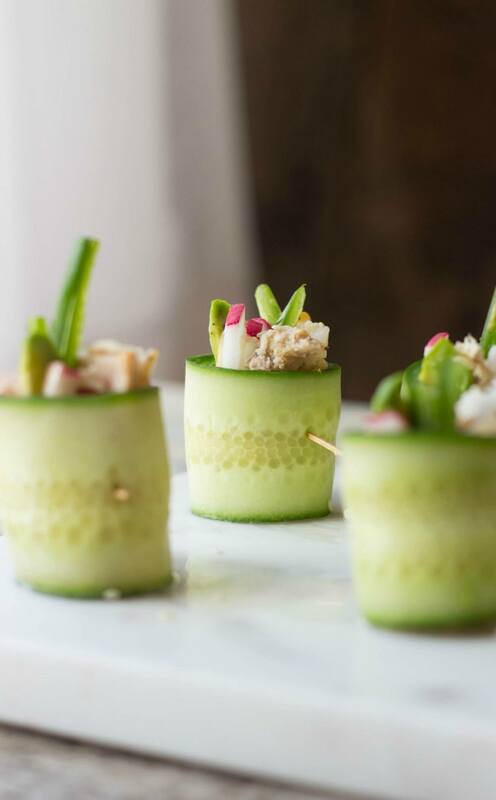 About 1 inch from the end of each cucumber slice, place a small scoop of rice and tuna, then layer with a few slices of jalapeno, a slice of avocado, a few radish matchsticks and a piece of pickled ginger. Season each with a dash of salt and pepper. Roll each, tucking the filling ingredients tightly in. Secure with a toothpick until ready to eat. Garnish with sesame seeds and serve with soy sauce.